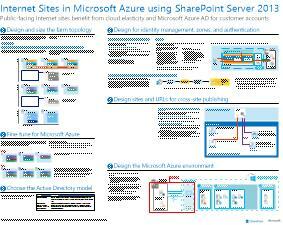 Summary: Internet sites that use SharePoint Server 2013 benefit by being hosted in Azure Infrastructure Services. This article provides resources for designing and implementing this solution. Focus on developing a great site instead of building infrastructure. Flexibility to scale your solution based on demand by scaling out and in. Pay only for the resources that you need and use. Take advantage of Azure Active Directory for customer accounts. Add features that are not currently available in Office 365, such as deep reporting and analytics. The following technical illustrations and articles provide information about how to design and implement Internet sites in Azure by using SharePoint Server 2013. This architecture model outlines key design activities and recommended architecture choices for Internet sites in Azure. Use this design sample as a starting point for your own architecture. 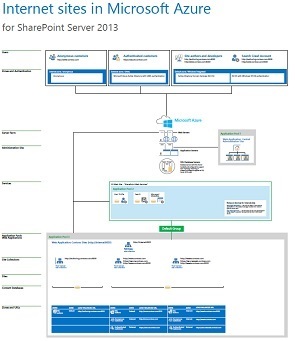 This article describes how to design Azure architectures to host SharePoint solutions.